1958 Netherlands. 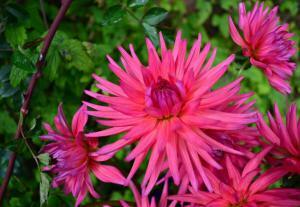 A stunning cactus type dahlia that looks great in bud form and then opens to reveal narrow petals of pink/purple flowers. 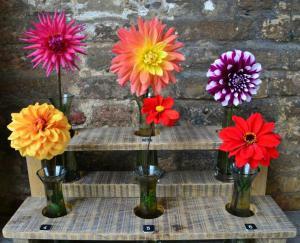 The RHS have Pontiac in their top five dahlias to try. 1950 Netherlands. The flower is like a flame turning from red/orange/yellow from the centre in. We grow it brilliantly in partnership with Ipomena lobata. Classified in the semi cactus group. 3. 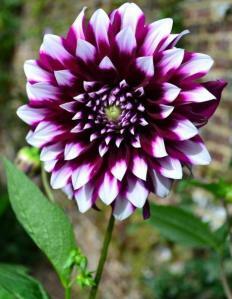 Dahlia ‘Edinburgh’ – Top Courtyard 1950 by Dobbies Ltd. Rich purple flowers tipped with white. 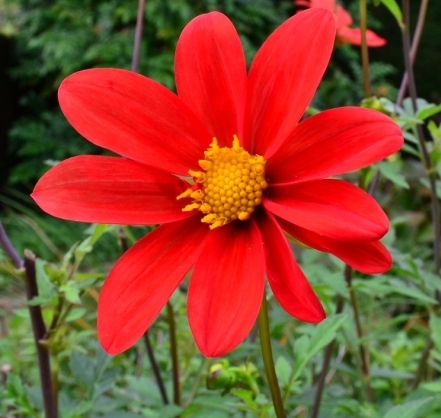 Classified in the decorative group of dahlias for its shape, form and classified as formal decorative by the American dahlia society. This was grown at Sissinghurst through Thalictrum delavayii to good effect. Bronze-tinged, slightly purplish foliage on well-filled, bushy plants with fully-double flowers. 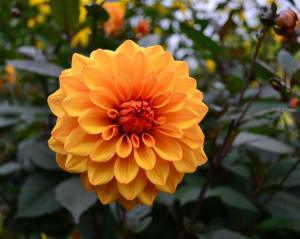 Each 10cm (4in) flower is a soft bronze orange shade, richer and darker in the centre. A prolific seedling of ‘Bishop of Llandaff’, raised and introduced in the 1950s by Norfolk nurseryman David Howard. Awarded garden merit by the RHS. Mexico 1978. Single scarlet flower with lush green foliage and dark brown stems. Classified as miscellaneous. What these species Dahlias lack in flower power they make up with grace and poise. This is an elegant plant in flower from May to the first frosts. Flower brilliant red, semi-double. This Dahlia has reached legendary status and is rightly widely grown. Elsewhere I have grown it with Verbena bonariensis – the stiff stems of the Verbena acting as convenient props for the Dahlia, it also look good with flowers of similar intensity such as Verbascum rorippifolium. Developed in Cardiff and introduced in 1924. Its blackish, bronze, sharply dissected foliage is the perfect background for the red flowers. Awarded garden merit by the RHS. 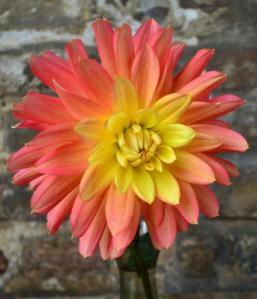 At Sissinghurst we take the dahlias up after the first frost on average late October. They are lifted and left to dry on the glasshouse bench and then divided and sorted. The tubers are grouped together in groups of three and planted in large pots containing bark chippings and labelled. They are then stored in the long house under the benches where they will stay until they start to show signs of growth. When we plant the Dahlias back in to the garden (Mid May) we add a mix of garden compost and grit to the base of the hole to provide nutrients and good drainage. The bark chip that they were planted in when they where lifted is kept around the plant because the roots have now grown through the bark and formed a strong network. The hole is backfilled and a small amount of garden compost is also added around the top of the hole. Once the Dahlias have reached a good height they will need to be staked before flowering. At Sissinghurst we stake our Dahlias with coppiced hazel which help to support the plants, as the flowers often become too heavy and begin to collapse. Slugs can be an issue with Dahlias especially when the new young shoots are appearing. Slug pellets can be used around the base of the plants to provide protection – organic slug pellets are now available. Also you need to keep a look out for powdery mildew and fungal diseases. Helen: good to hear from you. Yes, I read about the lost roses when it was posted, most interesting. Years ago I exchanged a few letters on that subject with Nigel N., it was after I toured the garden with a British friend — I was in school in England — and beforehand I read up with everything I could find. Vita died two years before I saw the place but Harold was still alive, though hardly in good health by then, and the garden seemed…well…iffy. But then I am not the most tidy boy you ever knew, so it didn’t worry me a bit. Lovely afternoon it was, some Japanese tourists were around to see the Virginia Woolf relics and Chris took a nap the Lutyens bench while I wandered around, all quite solitary. The List: from Nancy Lindsay’s nursery, 300 and some sorts, it has to be read to be believed and I an not sure that I do. I have a dark suspicion that she made up a lot of it, I mean identifications. She was ever the optimist, but it is true that she made important discoveries in Persia during her botanizing trips there and in France too. Several of her foundlings are in commerce still. Anyway, I have got through #200, verifying and so on, the dates, breeders, personages. Louis XIV is easy enough but some of the others! 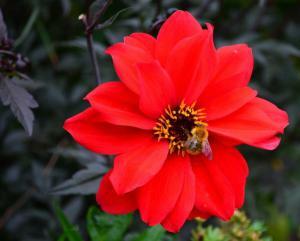 I’m looking for photos and information for the “Allegan” Dahlia which I understand exists in Sissinghurst Gardens.